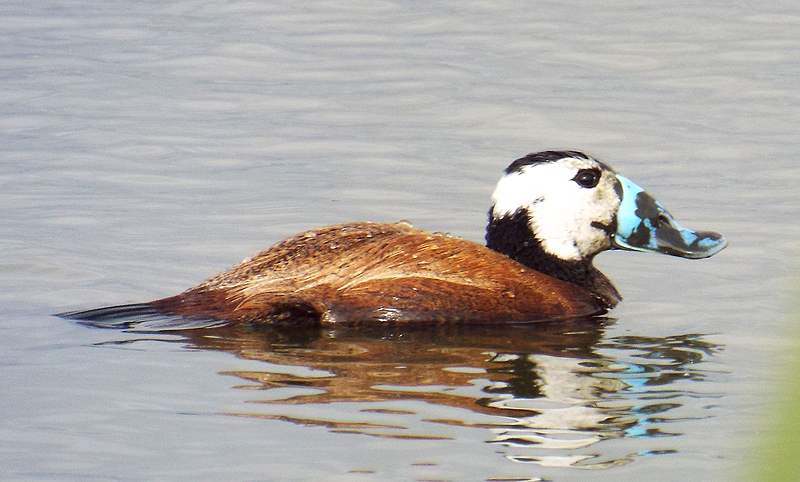 The White-headed Duck is one of the rarest Ducks of Europe, a victim of over hunting and loss of habitat. It is found in the Iberian peninsula, North Africa and Central Asia. In terms of British Ornithology though, it has another major significance, despite not being recorded as a vagrant here - it is the reason the feral population of Ruddy Duck is being eradicated. The two species are close relations, originally from North America (the Ruddy Duck) and Eurasia (the White-headed Duck) respectively, and it is claimed that interbreeding between the two species threatens the continued existence of the White-headed Duck. I've also seen claims to the contrary, but haven't seen specific data on the subject either way. Nonetheless, the White-headed Duck in Spain does seem to be showing some signs of recovery, though I suspect that is more immediately due to protection from hunting. Note that the dark markings on the beak in this photo are mud from diving, the beak is normally entirely blue.